Many people are lucky to be born completely healthy and never have to consider what it would be like to experience living with one kidney. Most people are born with two kidneys and never have to think about them or their function throughout life. Yet there are those who are either born with one kidney or circumstances lead them to have to live with only one kidney. It might sound like a dangerous or terminal condition, but it’s not! It is possible to live with just one kidney and have a long, healthy life with the right regimen. While typically taught in school at least once or twice, most people learn about the kidneys and then that information filters right back out of the brain. The kidneys are actually far more interesting and valuable than people think! Kidneys do amazing things for organs the size of an average orange. They are a cleansing powerhouse for the body and they produce important regulators to keep you healthy. Your kidneys filter out waste and cleanse the blood. They also maintain a healthy production level of red blood cells and keep blood pressure normal. At the end of the day, the kidneys have delivered around two-hundred quarts of fluid to the circulatory system! As amazing as these two organs are in the body, not everyone is lucky enough to have two working at the same time. An average of one person in every 750 is born with just one kidney. Other times kidneys must be surgically removed because of trauma or illness. In special cases, people have one working kidney only because they had one transplanted from a donor. Regardless of how it happens, the good news is that one kidney is adequate for the human body to function! However having a single kidney does require a person to be more careful with their health and safety. 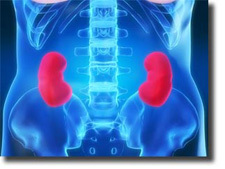 In people with a single kidney, the kidney tends to grow larger than two kidneys would in a typical body. This can mean that someone living with one kidney is at risk of having their kidney injured during contact sports. It doesn’t mean that a person with one kidney can’t participate in sports. They might have to make a decision not to participate for their health or they can opt to wear equipment specifically designed to protect their kidney. Taking care of one healthy kidney is essential to maintain a healthy lifestyle. This can mean some changes in the way a person does things or their habits, but to care for one kidney that is doing the job typically done by two it might not seem like such a big sacrifice! Anyone living with one kidney should see their doctor on a regular basis. Having one working kidney means that you only have that one organ to rely on instead of the typical two most other people have. This means that it is important to check for any sign of kidney problems. Finding a problem before it can develop into kidney failure can allow for treatments that can prevent it altogether. A person’s diet affects every aspect of their health whether they realize it or not and this is especially true when it comes to anyone living with a single kidney. In order to help the one kidney function properly, it is essential to provide it with the right nutrition that helps it do its job. Hydration is also very important in maintaining the health of a kidney. Because the kidney deals with the fluids of the body, a good balance is required for it to keep things running smoothly. Water is vital to the health of every person regardless of how many kidneys that they have, but a person with one kidney should be very aware of their water intake. Exercise is something people don’t think can relate to kidney health, but it does matter! Exercise is a wonderful way to bring down or balance blood pressure. It can also help with insulin in people struggling with diabetes. If a person is living with one kidney, they should check with their doctor for a specific exercise routine to follow. A person with one kidney should do whatever they can to help support their one hard-working organ! Nutritional supplements are a great way to do this and benefit the rest of the body. Some people even like to do a natural detoxification program once a year to help with the absorption of their supplements. It can also help improve kidney function. However before going on any supplement or doing a detoxification cleanse, it is very important to check with a doctor. Good communication and a commitment to following a doctor’s lifestyle recommendations are essential to healthy living when a person has one kidney. People with a single kidney might require a few more doctor visits and tests than others, but it is well worth the time to maintain and keep the kidney healthy.